Pro Volleyball League 2020 (PVL) is the first ever volleyball league to be played in India. The inaugural season of the games to start from 2nd of February 2020, while the Final to be played on 22nd February 2020. There are 6 teams currently participating in 2nd RuPay PVL 2020 season. 6 Teams, 12 International Star Players and 18 full action packed Macthes at 2 State of art Arenas. The first Indian PVL 2020 (2nd Feb-22nd Feb) is going to bring a new life to Volleyball in India. Since India has already started the famous Indian Premier League (Cricket) and Indian Super League (Football). The Volleyball Federation of Indian decided to bring in their own Pro League. Although this is not the Official Home of the RuPay Pro Volleyball League 2020. But we will be bringing PVL Schedule, Fixtures, Teams, Broadcasting, Live Scores and Live Streaming links for the Volleyball fans. The official hashtag #ThrillKaCall has already been set for the Social media vibes. How / where / when to buy Tickets for Pro Volleyball League? 1- When Pro Volleyball League 2020 is going to Start? 2- When is the final of PVL2020 India? 3- How many Teams playing in this volleyball league? 4- Where are the matches to be played? 5- Is there any Official Website of the Pro Volleyball League India? 6- Is there any Fantasy League of Pro Volleyball India 2020? 7- Which channel will broadcast the first PVL 2020 matches? 8- How many International Players Participating in the League? 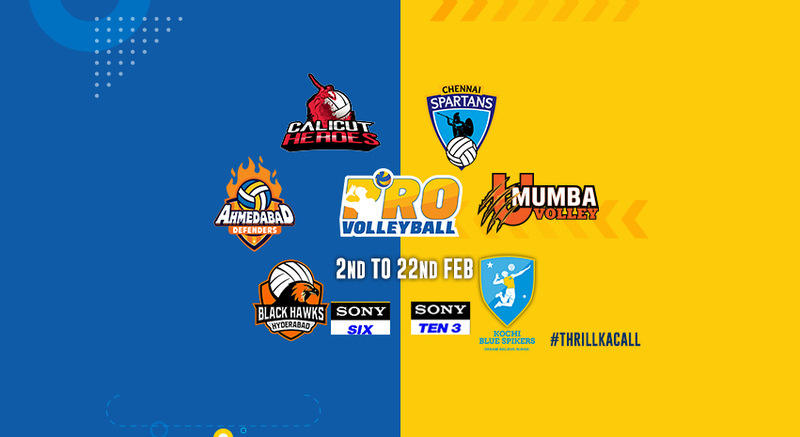 All the above teams representing each of the 6 cities participating in the PVL 2020 India. The detailed intro about the teams can be found in their respective homepages. (Links added below). There are total 6 Teams in Pro Volleyball league India 2020. As this is the first season, so teams are scheduled to play in a league format. Each team will play against another team once in a round-robin-format. The best 4 out of the initial 6 teams head to the Semi-Finals. 1st Leg matches to be played in Kochi, while the 2nd Leg matches including the Semi-Finals and The Final to be played in Chennai where the Final ceremony is going to take place and the first PVL 2020 trophy is going to be awarded to the Winner team. Here we dive deep into all nominated players in squads of each team. The teams have already submitted the International players to their squads. There are 6 top of the line International Players or Foreign Player in the list of Best Pro Volleyball League Players 2020. Just to add more to Pro Volleyball Fantasy league. New update suggests 6 More foreign players joining the Indian PVL 2020. So in total 12 players participating in this league, 2 players for each team. This first PVL 2020 will be broadcasted on Sony Ten 3 and Sony Six channels. While the official Live streaming will continue on the Sony Liv. According to the Sports board at SPN Rajesh Kaul narrated, “At SPN our focus has always been to promote a multi-sport culture in India and Pro Volleyball League is the perfect addition to our sports portfolio.” Now for those who want to Stream live matches can read this guide. How to watch Pro Volleyball League 2020 Matches Outside India. You can watch PVL2020 for free, using the best streaming apps, that work for free on any Android or iOS devices. Officially Sony Liv apps are going to stream PVL matches live online in India only. If you are outside India and want to watch Live streaming PVL 2020 matches then follow this. All the #PVL2020 matches will be hosted in 2 cities. The first leg in Kochi while the 2nd leg to be played in Chennai including both semi-finals and the Final. Here is the full map and direction to the Stadium. Kochi will host the first 12 matches of the PVL 2020. Last 3 League matches will be played here along with both Semi finals and the Grand Final. So in total 6 PVL 2020 matches to be played here. Here is the Stadium location on the Map. If you are into organizing upcoming events. Then here is the official PVL 2020 Facebook event page that you should follow. To know the exact timetable of matches coming up. Tickets for PVL 2020 has already started the sales. The SPN network and the owners have already posted the ticket buying links online. You can get the official Tickets from Insider.in page. You can follow us on Social media and also share this post to make it reach more people. As this is the first International Volleyball league to be played in India, So people already asking so many questions. We tried to answer the most common ones here. The first season of the Indian PVL 2020 is going to start on February the 2nd, 2020 at Rajiv Gandi Indoor Stadium, Kochi. The final match of the first PVL 2020 will be played on 22nd February 2020. There are 6 teams playing in this 1st Pro Volleyball Indian league 2020. The PVL 2020 matches to be played at Kochi and Chennai. No there is no Fantasy league started yet. But in near future, it could very well be possible. Here are the details about the PVL2020 Fantasy league. The pro volleyball league is going to be live on Sony Six and Sony Ten 3 channels. Both in English and Hindi Commentary. There are 6 players confirmed so far, who will be the part of the league. But the new news out there that 6 more international players are already in talks. More info here. One new development today is that RuPay is going to be the Title sponsor of the first Pro Volleyball League 2020. So from now on it’s RuPay PVL 2020.